Peru is truly one of the most wonderful and exotic travel locations in the world. From the vast expanses of the Sacred Valley, the bustling city-life of Cusco, to the ancient ruins of Machu Picchu, there is something for all. This fact file will sum up the best bits of Peru, compiling need-to-know information from those who have previously embarked on the challenge. Peru was a Spanish colony from the early 16th century after many wars throughout the time; Machu Picchu was one of the last Inca strongholds due to it's isolated, hidden location. Peru remained a Spanish colony until independence was gained in 1821. Military coups, political turmoil, and radical reforms characterised the country for the next several decades, all of which have recently slowed. 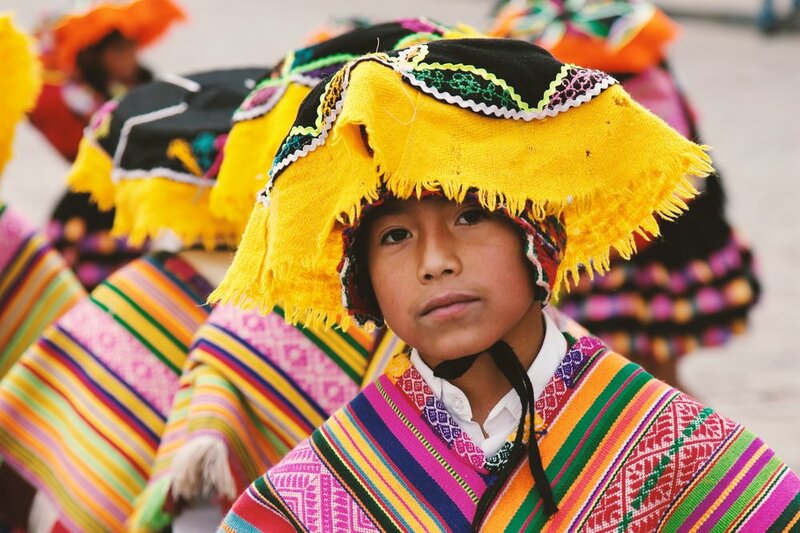 Peruvian culture is a mix of beautiful hispanic and native traditions. The Quechua and the Aymara are the two main native cultures of Peru, both of which speak speak their native languages. These Inca descendants have successfully preserved and developed their proud cultures despite the creeping in of globalisation. Peru has the highest sand dune in the world. The Pisco Sour is Peru's national drink. Peru grows more than 55 varieties of corn, and over 3,000 varieties of potato. Cotahuasi Canyon in Peru is the deepest in the world, almost twice the depth of the Grand Canyon. There are penguins in Peru! The rich culture in Cusco is characterised by numerous markets, museums, and places of interest. Check out Lucy's blog about visiting Cusco here. There are loads of great places to experience the local cuisine in Cusco. Check out Cait's blog on her experience of food and drink in Cusco here. Quechua, the official language of the Inca, is seldom spoken in Cusco compared to the rest of the country. Cusco is surrounded by mountains in all directions, making it relatively isolated within Peru. Cusquenos (denomination of ancient Inca) are common in Cusco; they are friendly, welcoming and amicable. If you and your phone are in an inseparable relationship, look away now. Unfortunately, there is very rarely phone signal throughout the Salkantay route and up Machu Picchu itself. In addition, there is limited access to electricity, so bring a powerful external charger or be prepared to face the great outdoors without any distractions! As may be obvious by now, the views in Peru (and especially Machu Picchu) are absolutely stunning. Bring your camera to make it real. Trust us, you'll want to have something to remember the jaw-dropping, awesome landscape along the trail. If anything, the views are motivation where some may struggle in the process of trekking. During the trek, accommodation is invariably good quality multi-share tents. Be prepared for the fact that some of the campsites will not have "Western-style" washing and toilet facilities, so a shower a day will be a luxury! Whilst trekking, hot food will be provided for breakfast, lunch, and dinner to ensure you're intaking a sufficient amount of calories to fuel your journey. Special dietary requirements will be catered for as long as you have informed the Choose A Challenge team in advance. Machu Picchu is made up of more than 150 buildings ranging from baths and houses to temples and sanctuaries. The Incas were some of the best masons in the world. The structures were so well built with a technique called ashlar (stones that are cut to fit together without mortar) that not even a knife blade can fit in between stones. Machu Picchu was an astronomical observatory, and its sacred Intihuatana stone accurately indicates the two equinoxes. Twice a year, the sun sits directly over the stone creating no shadow. Unfortunately, most cities built by the Inca civilisation were destroyed by the Spanish conquest. Machu Picchu was in a hidden location—invisible from below—and was therefore not found, making it one of the most well-preserved Inca cities and an archeological gem.